When we departed for Kananaskis country just before 8 o’clock yesterday morning, we had big plans for the day: hike up to Headwall Lakes to check on GCXQ46 (one of the first few geocaches we hid); continue up the valley to summit Fortress; descend the scree slope on the Chester Lakes side: and hike back to parking via the Chester Lake trail, with a short side-trip to GCXW99 (to replace the camo bag which apparently rotted away over the winter). The drive out went smoothly and we stopped at the Barrier Lake Visitor Centre to confirm the weather forecast (mixed sun and cloud; no rain expected) and trail conditions (a bit muddy with a few isolated snow patches at the higher elevations). We pulled into the Chester Lake parking area about 9:30 and set out on the trail to Headwall Lakes a few minutes later. The first section is pretty easy – gentle elevation gains, very wide (x-country ski trails) – and there were lots of wild strawberries to enjoy along the way. At about the 3 km mark we donned our raincoats, in anticipation that the next trail section (through the forest and shrubs) might be a little wet on account of the previous night’s rain. In fact Mr. GeoK’s pant legs got quite wet, as he was leading the way. But it was sunny and warm and they quickly dried out while we traversed the talus field and tackled the short, steep climb up to the first lake. We paused here to hide a new micro cache and enjoy the view and then tackled the climb up to the second lake. This one is shorter and parallels a beautiful waterfall which we’re going to try to set up as an earthcache. The cache we placed 2 years ago is hidden near the second lake; it took us about 10 minutes to find, as there’s nothing but rocks, rocks and more rocks here. The coordinates turned out to be spot on but even so, we elected to move the cache about 25 meters to a more readily-identifiable hiding spot. Then we settled down to enjoy lunch. Thick clouds were moving in by this time, but they were white and fluffy and with the the day’s weather forecast in mind we were a little disappointed that we weren’t going to be getting any great photos from the top of Fortress but otherwise not concerned. After packing away the remains of our lunch we continued parallel to the second lake and around the corner into the next leg of the valley. It was very pretty, with a creek running along the valley bottom, lots of moss and interesting black and while striped rocks making up the talus. About 45 minutes after lunch it started snowing – very lightly. We were about halfway through the total distance for the loop, so we decided to carry on, agreeing that we might have to cross over the saddle and down the Chester Lake side without making the short climb to summit Fortress. 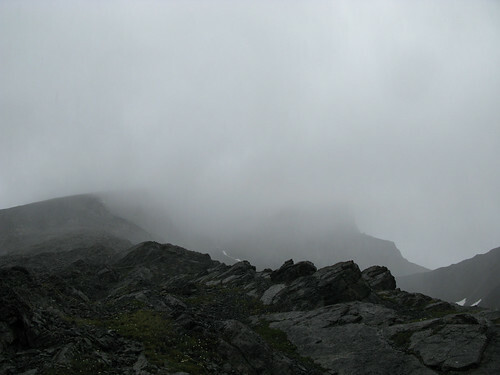 Unfortunately, we were not able to locate the easy scramble routes up to the saddle. And the snow started coming harder & faster, with the wind blowing it pretty much sideways. Once a cm or two of snow accumulated on the rock slabs, conditions became extremely challenging. We were on a 65+ degree slope and grew increasingly concerned that one or more of us would end up sliding a fair distance down the mountainside. So about 200 meters from the saddle and 600 meters from the summit, we decided to turn back and return to parking the same way we’d come up. We gave our geocaching gloves to the GeoKids, but since Mrs. GeoKs’ gloves are leather they soon became wet (and cold). Youngest GeoKid started getting very cold and we took turns holding his hands inside our pockets. But with the wind blowing the snow sideways things soon grew worse. We had raincoats, so our torsos were staying dry and warm, but our pant legs were soon soaked. It was then only a matter of 15 or 20 minutes before water started running down our legs and seeping into our Gortex boots. 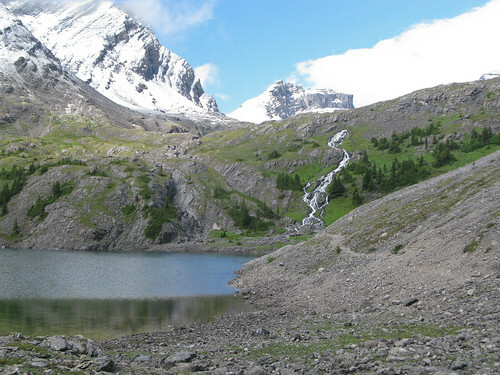 By the time we reached the east end of the upper lake, Youngest GeoKid was shivering like crazy and we had another 7 km to go to the parking lot. Fortunately, just about that time, our prayers were answered and the sun started peeking out. Almost 3 hours after we spotted the first snow, it finally stopped. Everyone took their pants off so we could wring them out and dry our legs with the micro-towel Kyle carries in his pack. We used our body heat to warm Youngest GeoKid up to the point he stopped shivering and then we continued back down the trail. The steep portions were extremely slippery and challenging, so we paired up to help the GeoKids safely descend. 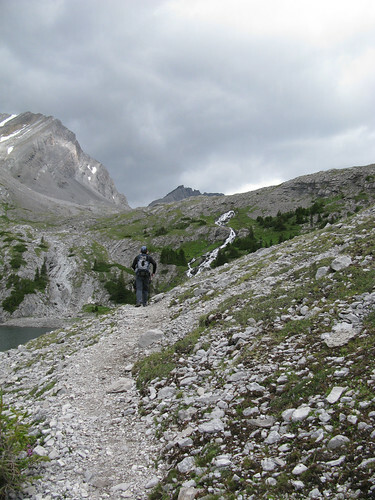 Once we reached the talus field below the lower lake we knew we’d be OK even if it rained or snowed again. Our pants were dry and everyone was reasonably warm, although we had about 5 km to go and it was already after 5 o’clock. My pants got pretty wet as I led the way along the closely-grown trail through the brush and trees, but they almost dried out (again) by the time we finally reached the parking lot at about 6:45 pm. We lost one trekking pole somewhere on the way down, but that’s a small price to pay for everyone getting back safe and sound. Our boys were troopers; naturally Youngest GeoKid complained a bit about how cold he was. But he also vehemently declared “I’m not going to die on this mountain” and kept on going. Oldest GeoKid was a rock, understanding that Youngest GeoKid needed some extra attention and following uncomplaining behind us. Mother Nature gave us a stern reminder: be prepared. For us, that means ALWAYS carry the rain pants, not just the rain coats; carry toques, even in the summer; consider purchasing neoprene gloves and/or carrying chemical hand warmer packs. And finally, remember and USE the emergency supplies you have in your pack (I was carrying an emergency blanket, candles and some waterproof matches). Total distance = 20.2 km; elevation gain = 800 meters.BTW – guess we’ll be heading back out to Chester Lake before hiking season ends. We still need to replace the camo bag on our Beyond Chester geocache!